(From left) Shucong Liu, Katie Stevens, Brandon Knop, Christopher Grady, Jarrett Doe, Esther Barron, and Vanessa Bachtell attend the national LawMeet competition on April 1. 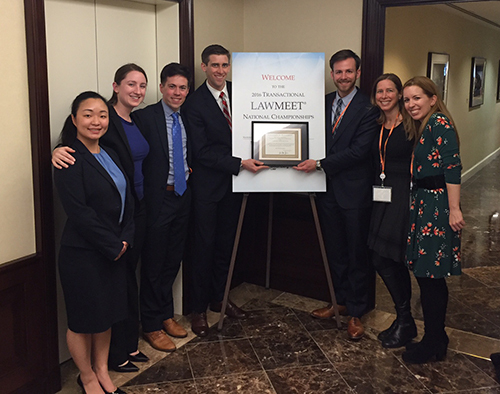 Christopher Grady (JD ’17), Brandon Knop (JD ’17), and Katie Stevens (JD ’18) were awarded Best Draft at the National Championship of the 7th Annual Transactional LawMeet in New York City, and finished in third place in the negotiation component. In this year’s competition, teams negotiated a merger of two emerging technology companies. The drafting stage took place over two months, with students drafting term sheets, interviewing their clients, and marking up opposing teams’ drafts. “LawMeet provides students with a fantastic opportunity to work on a complex transaction; they gain experience drafting and negotiating the terms of the deal,” said Esther Barron (JD ’95), clinical professor of law and director of the Donald Pritzker Entrepreneurship Law Center. At the regional rounds in February, 84 teams competed in a live negotiation. Northwestern Pritzker School of Law teams secured three of the top awards. Thomas Guzman (JD ’17), Daniel Siegel (JD ’17) and Samuel Tuttleman (JD ’17) won semi-finalist for the Midwest region; and Grady, Knop and Stevens were winners of the Best Draft award and were finalists for the New England region. The Northwestern Pritzker Law teams were coached by Vanessa Bachtell (JD ’99), a principal at Goldberg Kohn. Jarrett Doe (JD ’18), Shucong Liu (JD ’18), Raphael Valenta (LLM/K ’16), Justin Clune (JD-LLM IHR ’16) and Chirag Agrawal (MSL ’16) served as student coaches.